We had a fantastic Noise from the Next Generation competition this year with some brilliant solo artists and bands from Nottingham City. Noise from the Next Generation is a music competition for young people in Nottingham City organised by Nottingham Music Service in collaboration with the Young Creative Awards. The competition is for bands/artists/acts that have a majority of members who live, study or work in Nottingham.This means that you may live outside the city, but as long as you attend a school, college or university within the city or work within the city you may still enter the competition! There are 2 categories for different age groups: 13-15 and 16-18. This year as always, we have some FANTASTIC prizes for our NNG winners, including recording time at Confetti, recording time at YMCA Digital, performance at RadFest 2k19 and more! Bands and artists that go through the Heats and are selected as finalists have the benefit of attending a workshop before the final event. This year our workshop mentors were the amazing Nina Smith and Hector LeMans! They led a great session with the finalists, giving them the tip and advice they need to succeed as musicians in the city. Nina Smith is an incredibly talented singer/songwriter from Nottingham and has performed all over the city. Her debut album has just come out! You can read about her work here. Hector LeMans is an up and coming musician from Nottingham and you can listen to his music here. After a fantastic final at The Maze on March 4, 2019, we can say that all four finalists were absolutely BRILLIANT! Ellie Stainsby- Grenville and Cody Shaw both won Artist Management by YMCA Digital and Anthony Ivan Riddell won recording time by YMCA Digital. Congratulations everyone! Tilly Greentree won an automatic entry into the Future Sound of Nottingham semi-finals. Best of luck, Tilly! Tilly also won the audience award that night and gets an interview in the wonderful LeftLion. Blank Youth won a Nusic Future Session AND a performance opportunity at the great RadFest 2k19. Weekends on Wednesdays won recording time at Confetti. Congratulations everyone! A massive thank you to everyone who entered the competition and their friends and family who came to support them at the performances. It was a great competition and we're already looking forward to the one next year! After an exciting heats, four acts went through to compete in the Junior Finals at the Maze and four performed at Rock City in the Senior category final. Read below for results and check out our gallery for this year's photographs! 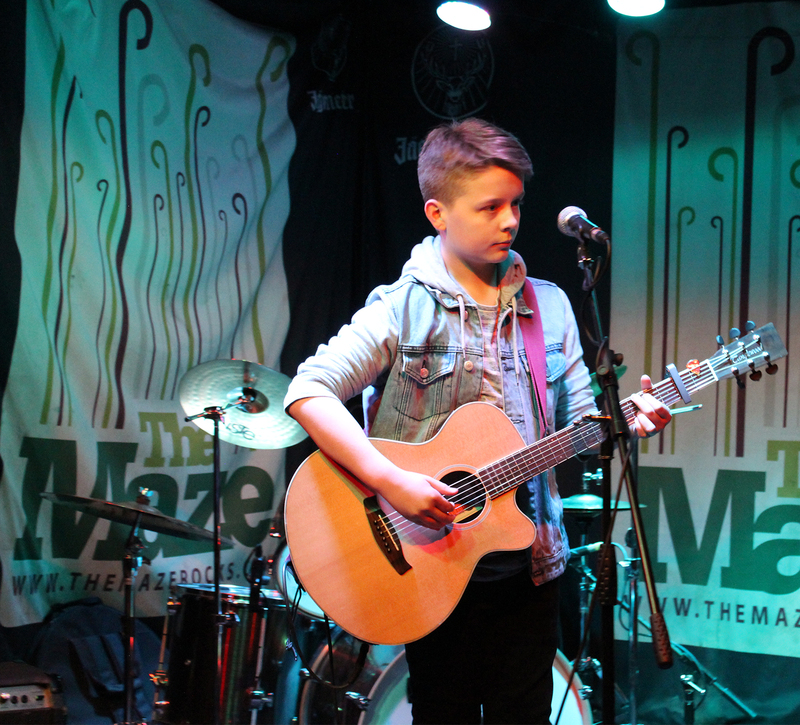 We had some amazing performances at the 13 - 15 Age Category final at the Maze on March 5, 2018. Laura Shaw won Artist Management and recording time at YMCA Digital while Matthew Baggaley won the opportunity to perform at YMCA Digital's Young Creatives Showcase at the Nottingham Street Food Festival. Our judges included the wonderful Nina Smith, who has recently been the BBC Introducing National Artist of the Week and her EP is number 5 in the iTunes chart. The 16 - 18 Age Category Final was held on March 11 at Rock City and we had four amazing sets! Youth Hotel won a recording session with Confetti and will also be performing at the Radfest Music Festival. Left Hand Lane and Burnside Green shared the Audience Prize (with the most number of votes) and will each get an interview with Leftlion. All entries were recorded and will be entered into the Young Creative Awards for the music category. A massive congratulations to all our entrants and winners, and a warm thank you to all the friends and family who came to support the musicians and to all our partners for the awesome prizes. The Young Creative Awards is also open to entries from other categories including Film, Dance, Fashion, Photography and more. Visit http://www.youngcreativeawards.org/ to find out more. Last year, one of our winners - Laura Shaw - also won the YCA Music Award! So proud of our young musicians! Entrants compete in a first round of Heats and the finalists for both age categories then participate in a workshop. The workshop is a great opportunity to get some professional tips for the final performance. Two finals are held, with one for the 13-15 Age Category (usually at the Maze) and one for the 16-18 Age Category which has been held at Rock City for the last few years. NNG is a brilliant opportunity to tap into the city's local music scene. The Maze and Rock City are two of the most popular live music venues in Nottingham city and it would be a fantastic opportunity to perform there. Moreover, our winners have performance opportunities throughout the year so winning the competition can really open up a host of exciting gigs! Every year, one of the NNG awards is automatic entry into the Future Sound of Nottingham semi-finals. Future sound of Nottingham (FSN) is an annual music competition organised by Nusic. The winners of the competition get a chance to play at Splendour music festival, for an audience of around 20,000 people! Read more about the competition on the Nusic website .